Garment measurement at bust: 32 (36, 40, 44, 48, 52, 58)”/80 (90, 100, 110, 120, 130, 140) cm. 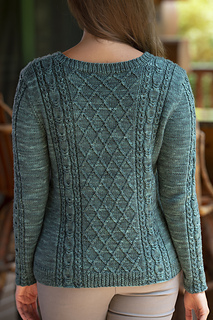 The original version of the Tracery Pullover (worked with different shaping in a now discontinued yarn) was my first Rhinebeck Sweater: an autumnal pullover that I was excited and proud to show off at the popular fall Sheep & Wool Festival. I’m finally ready to share it with everyone. 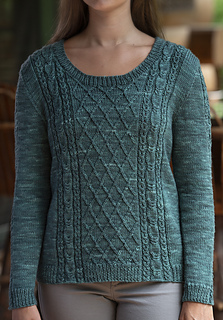 This pullover is rich with textural details, incorporating cabled panels on every piece. 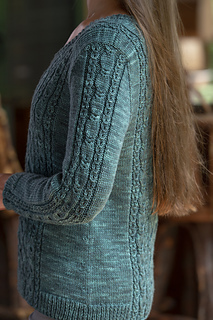 A scoop neck, set in sleeves, and a slight A-line silhouette all add up to a classic, flattering sweater, perfect for wearing out or for cozying up with a mug of tea and a good book. This garment is knit in pieces and seamed. The texture patterns include both written and charted instructions. Miss Babs Yowza (100% Superwash Merino; 560 yd/8 oz (512 m/250 g) skeins) 3 (3, 3, 4, 4, 4) skeins, shown in Beryl. Or 1200 (1300, 1450, 1600, 1750, 1900, 2050) yards/1080 (1170, 1305, 1440, 1575, 1710, 1845) meters of light worsted weight yarn. For best results when working with hand dyed yarns we strongly suggest alternating skeins of the same color throughout your project. To Fit bust sizes: 30 (34, 38, 42, 46, 50, 56)”/75 (85, 95, 105, 115, 125, 135) cm. Choose a size with 2-4”/5-10 cm of positive ease. Shown in size 34”/85 cm. US 6 4mm straight or circular needle, or size to obtain gauge. US 5 3.75mm, circular needle, 16”/40 cm (for neckband), or size to obtain gauge. Blocked: 22 Stitches and 28 Rows = 4” in stockinette stitch. Blocked: Panel A: 3”/7.5 cm wide. Set-Up Row (Wrong Side): P1, (k1, p1) 8 (11, 14, 17, 20, 19, 23) times, place marker, work Set-Up Row of Panel A over next 20 stitches, place marker, (p1, k1) over next 32 (32, 32, 32, 32, 48, 48) stitches, p1, place marker, work Set-Up Row of Panel A over next 20 stitches, place marker, p1, (k1, p1) to end. Row 1 (Right Side): K1, (p1, k1) until marker; work Row 1 of Panel A over next 20 stitches; k1, (p1, k1) until marker; work Row 1 of Panel A over next 20 stitches; k1, (p1, k1) to end. Row 2: P1 (k1, p1) to marker; work Row 2 of Panel A over next 20 stitches; p1 (k1, p1) to marker; work Row 2 of Panel A over next 20 stitches; p1, (k1, p1) to end.